Peter Camejo, one of the world's most influential Marxist-Leninists has died in the US. Beginning his political career as a Trotskyist, Camejo went on to run a large investment business. He remained a socialist throughout, leading the Trotskyist infiltration of the US Green Party with some of his old comrades and newer recruits from the US International Socialist Organisation. 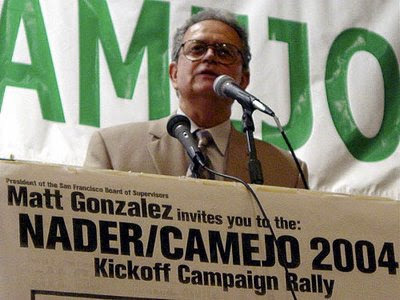 In the early '90s Camejo, already active in the US Greens became a founding member and leader of the Committees of Correspondence, a Marxist-Leninist organisation formed from a split in the Communist Party USA. Camejo openly described himself as a "watermelon"-green on the outside, red in the middle. Peter Camejo was a longtime leader of the United States Socialist Workers Party. As a leader of the Young Socialist Alliance, the youth group associated with the SWP, Camejo was a prominent activist in the student movement at the University of California in Berkeley and in the anti-Vietnam war movement. He was the presidential candidate of the SWP in 1976. He parted company with the SWP in 1980 as its politics increasingly became more sectarian. In 2004 Camejo ran for vice-president of the United States with the progessive presidential candidate Ralph Nader. He stood for governor of Califonia three times for the Green Party, most recently in 2006. Camejo was politically active to the last, throwing his weight behind the candidacy of Ralph Nader for US president in 2008. One of those visits occurred at Easter 1994 when he attended a DSP sponsored Green Left gathering in Sydney. Camejo spoke alongside New Zealand's own top "watermelon", Green Party leader Jeanette Fitzsimons.